The 2018 Christus Rex Award recipient is Robert Buckley Farlee who received his award on April 11, 2018 at the closing banquet of the gathering of the Institute of Liturgical Studies. 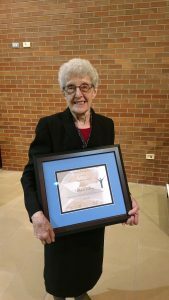 The 2017 Christus Rex Award recipients were Sister Delores Dufner and Rev. 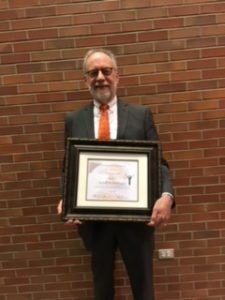 Dr. Frank Senn, who received their award on April 26, 2017 at the closing banquet of the gathering of the Institute of Liturgical Studies. Sister Delores Dufner and Rev. Dr. Frank Senn were the 2017 Christus Rex Award recipients. The 2016 Christus Rex Award recipient is Paul Westermeyer, who received the award on April 6, 2016 at the closing banquet of the gathering of the Institute of Liturgical Studies. 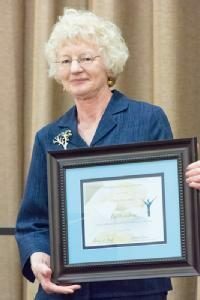 The 2015 Christus Rex Award recipient is Gail Ramshaw, who received the award on April 15, 2015 at the closing banquet of the gathering of the Institute of Liturgical Studies. Gail Ramshaw is a scholar of liturgical language. 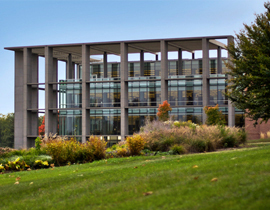 A graduate of Valparaiso University (B.A. 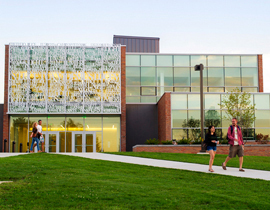 ), Sarah Lawrence College (M.A. 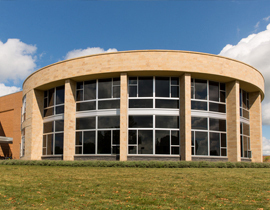 ), the University of Wisconsin-Madison (Ph.D.) and Union Theological Seminary (M.Div. 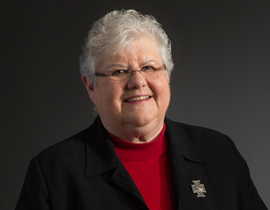 ), she lives outside of Washington, D.C. A past president of the North American Academy of Liturgy, a recipient of the NAAL Berakah award, and a member of Societas Liturgica, she is a Professor Emerita of Religion at LaSalle University. Ramshaw has published two textbooks, What Is Christianity? An Introduction to the Christian Religion (Fortress, 2013) and Christian Worship: 100,000 Sundays of Symbols and Rituals (Fortress, 2009). Her books about the meaning of liturgical language include A Three-Year Banquet: The Lectionary for the Assembly (Augsburg Fortress 2004); The Three-Day Feast: Maundy Thursday, Good Friday, Easter (Augsburg Fortress 2004); Treasures Old and New: Images in the Lectionary (Fortress 2002), and several others. 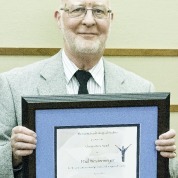 The 2014 reipient is Carl Schalk, who received the award on April 30, 2014 at the closing banquet of the gathering of the Institute of Liturgical Studies. Schalk is a noted Lutheran composer, author, and lecturer. 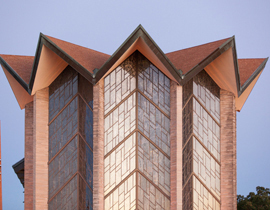 Between 1965 and 2004, he taught church music at Concordia University Chicago. The 2013 recipient is Deaconess E. Louise Williams, who received the award on April 10, 2013 at the closing banquet of the gathering of the Institute of Liturgical Studies. The 2012 recipient is Rev. Gordon W. Lathrop. 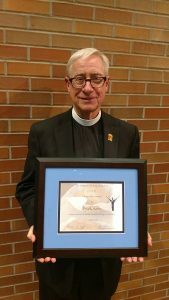 Lathrop received the award on April 18, 2012 at the closing banquet of the gathering of the Institute of Liturgical Studies. 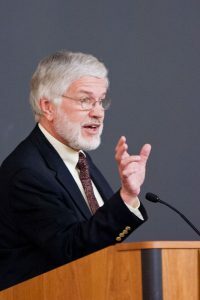 Gordon W. Lathrop is a pastor of the Evangelical Lutheran Church in America who has recently been Visiting Professor of Liturgical Studies in Yale Divinity School and is Professor of Liturgy Emeritus at the Lutheran Theological Seminary at Philadelphia. He lives in Philadelphia with his wife. He is author of several books, including Holy Things: A Liturgical Theology (Fortress 1993), Holy People: A Liturgical Ecclesiology (Fortress 1999), Holy Ground: A Liturgical Cosmology (Fortress 2003), The Pastor: A Spirituality (Fortress 2006), and The Four Gospels on Sunday: The New Testament and the Reform of Christian Worship (Fortress 2012). 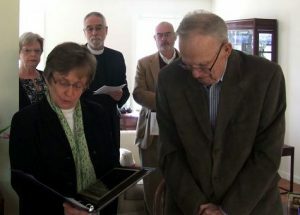 In March 2011, the Christus Rex award was presented to George Hoyer in a ceremony at his home. Bishop Margaret Payne, Rev. Susan Nachtigal, Rev. Christopher Hoyer, Rev. Peter Hoyer, and other members of the New England synod participated in the presentation. Please follow this link to “Ode to Blessed George,” written by Robert Bergt in honor of Rev. George W. Hoyer, recipient of the 2011 Christus Rex Award. The Rev. George W. Hoyer displays his Christus Rex Award. Bishop Margaret G. Payne of the New England Synod presents the Christus Rex Award to the Rev. George W. Hoyer in March at his home in Holden, Mass. In the background are Prof. Hoyer’s daughter-in-law and two sons – left to right, Mrs. Doris Hoyer of Sudbury, Mass. ; Pr. Christopher George Hoyer, St. John Lutheran Church, Sudbury, and the Rev. Peter S. Hoyer (retired) of Bradley Beach, N.J. Colleagues of the Rev. 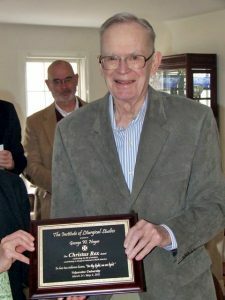 George W. Hoyer, 91, a retired seminary professor, gathered at his home in Holden, Mass., in March as Bishop Margaret G. Payne of the New England Synod presented him with the prestigious Christus Rex Award. 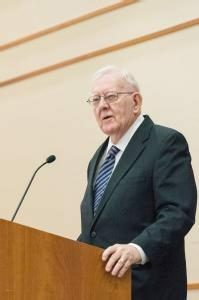 The award is given annually by the Institute of Liturgical Studies at Valparaiso University, Valparaiso, Ind., to celebrate an individual’s life work of contributing to liturgical scholarship and renewal in North America. The presentation was accompanied by prayer and hymns. Among those honoring Hoyer were his two sons, the Rev. Peter S. Hoyer (retired) of Bradley Beach, N.J., and Pr. Christopher George Hoyer, St. John LC, Sudbury, Mass., as well as Pr. Christopher’s wife, Doris Hoyer. He moved to Massachusetts in 1998 and joined Trinity Lutheran Church, Worcester, Mass.